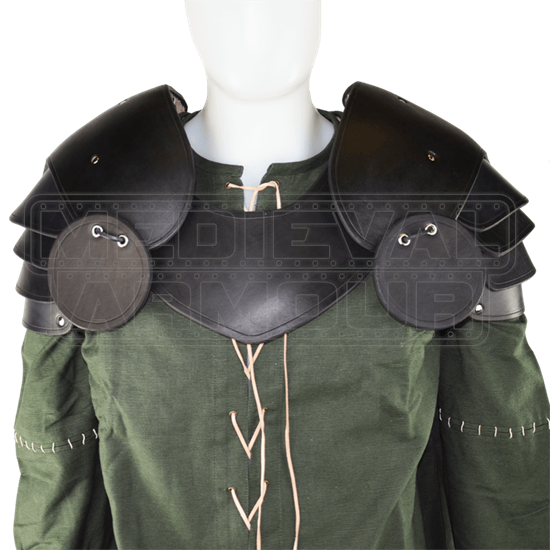 These sharp looking leather pauldrons are specially designed and conformed to the shoulder to provide more protection by using a larger section of leather, using the courbouille hardening method, and shaping to better cover the shoulder. This means the upper shoulder piece will arrive nicely molded and ready to wear. There are four lower lames for upper arm protection. The circular besagews lace on to the formed shoulder and will provide protection to the underarm area. The pauldrons have a strap and buckle at the underside of the shoulder so you can attach these to a gorget or a breastplate that has D-rings. There is also a strap and buckle on the lowest lame to attach to your arm. The back of the shoulder plates are larger to protect the shoulder blades. It is made of thick 13/15 oz. armour grade leather. The pauldrons look awesome and are very well-made. Just make sure to note that the gorget pictured is sold separately, and that you need something (gorget or chest armour) on which to mount them.